Rainbow cuisine for a rainbow nation. South Africans love mixing and mashing. Thousands of settlers, slaves and other migrants brought their own culinary delights creating a kitchen which is full of a multitude of tastes and flavors. You only have to take a stroll down Kloof and Long Street to see the variety of foods that South Africans enjoy. Local corner café and shop. Serves small dishes, salads, sandwiches and cake. Makes excellent coffee and tea. For everyone who does not feel of going out or wants a bite in-between. A little gem of a Pizzeria with superb Italian food and vibe - very relaxed and intimate. Societi Bistro is a neighborhood local. Set in a restored Georgian styled house it is “home from home”. The country themed menu is adapted seasonally and the dishes are prepared with locally-sourced, organic ingredients. Culinary excellence in an elegant setting. Serving classical dishes with influences from the East to the West - great Vegetarian inspirations. Vibrant relaxed restaurant - in décor, atmosphere and menu. Exploding tastes with excellent fish and meat. Smart service and wonderful dishes. More tips depending on your mood and feel for taste once you are here. When the French Huguenots arrived they changed the landscape in wonderful ways with the wines they imported. The Cape's 18 official wine routes, and two brandy routes, are among the most scenic in the world, featuring many historic wine estates that date back centuries. Take your time exploring this magnificent part of South Africa's Western Cape Province. It is not just the wine itself, but also the own unique character of each estate which makes your visit a special experience. There is almost no better place to enjoy a picnic or a sunset tasting against a backdrop of the mountains. The Constantia Valley is home to some of South Africa’s oldest and most famous estates, like the Groot Constantia, the largest estate. 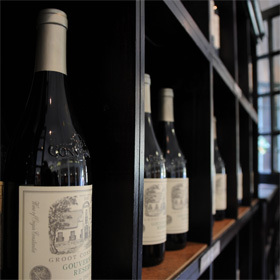 Close by you will find the Buitenverwachting, also renowned for its world-class wines. 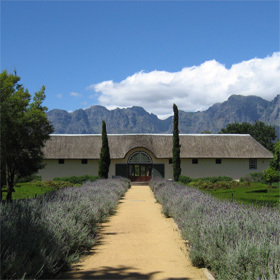 The Helderberg wine route will take you to more than 20 estates, including the famous Vergelegen and Avontuur wineries. 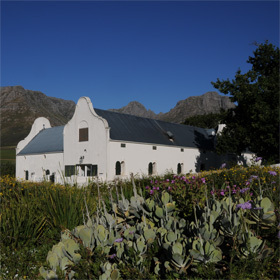 The area is bordered by the Helderberg mountains which makes for an impressive backdrop for the estates along the route. Paarl, the third-oldest town in South Africa, is home to the internationally renowned Nederburg Wine Estate, as well as numerous other premier brands. While Shiraz has been chosen as the signature cultivar a wide range of other styles also perform extremely well. 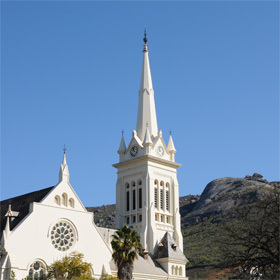 Visitors should include a trip to one of the largest solid rocks in the world – Paarl Mountain – and the restored historic buildings that flank the main street. Home to more than 140 wine farms, Stellenbosch, also known as the Eikestad (City of Oaks in Afrikaans ) is the second oldest town in South Africa. Stellenbosch and it's winelands boasts the largest concentration and variety of wine farms and wine tasting venues in the country and together form the wine making, research and viticultural hub of South Africa. Oak lined streets and a holiday atmosphere make this quiet "old world" town the perfect base for wine and culture lovers alike. 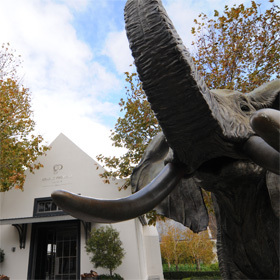 Franschhoek‘s excellent restaurants, stunning mountains and hospitality are legendary. Spend time browsing the many arts-and-crafts shops, galleries and antique stores in the small town’s centre. The Wine Valley is also famous for its food and is acknowledged as the ‘gourmet capital of South Africa’. Visit the Franschoek Car Museum which has one of the largest collection of vintage cars in the world.